Wait... you want me to pay someone to show me the FREE Las Vegas lights? Riiiight. Check out more of our Scenic faves! You could walk around and check out the Vegas lights on your own... or you could fork over almost $50 to have someone else show you around on a Las Vegas Lights Tour at Night. Okay, so it doesn't make much sense but it is convenient. Especially if you're one of those people who are allergic to walking! Ride around and hop out at the most iconic and scenic Vegas light attractions. The Las Vegas Lights Night Tour is a three and a half hour tour with a little walking and a lot of riding. There is no age limit so kids are welcome to tag along. Book the Las Vegas Lights Tour at Night to see the brilliant Strip lights because who wants to see them for free, right? The Las Vegas lights are spectacular and an attraction in and of themselves, but paying to see them... well, we'll leave that up to you! At least you'll see the most iconic Vegas sights on the Las Vegas Lights Night Tour. Cheap Tour: The Las Vegas Lights Night Tour is definitely not an expensive Vegas tour; each person will pay less than $50 for their ticket. If you're looking for cheap Las Vegas tours for the family, then this could be it! Or you could just be a normal person and go see all the lights for free. We won't tell you how to spend your money, though we do suggest using hotel promo codes to book your room. Save money and maybe find a better tour! Iconic Vegas: Las Vegas is known for it's lights... it's many, many lights. You'll stop at the most iconic spots in Las Vegas to see them lit up at night. Our favorite stop on the Las Vegas Lights Night Tour is the Fremont Street Experience with it's 12 million LED lights in downtown Las Vegas! Keep in mind that you won't be getting picked up at your Vegas hotel. 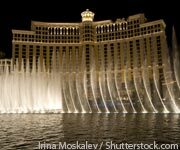 You'll need to meet the group at Bally's Las Vegas to take the Vegas lights tours. Do Take Pictures: Perhaps the best part of the Las Vegas Lights Tour at Night is that you can comfortably take pictures from the vehicle. You'll get out at the best Vegas lights, so having a camera for those stops is also something you won't regret. Do Take the Kids: Kids are welcome to join you on Vegas lights tours. Though we deny any responsibility if they don't have a good time and keep asking about Adventuredome. Don't Miss Other Tours: This tour is... meh. There are plenty of other great tours that you can take while you're in Vegas and many that don't charge you to see something that's already free! Spend smartly in Sin City by using Las Vegas hotel deals and then you'll have more cash to book a better tour. Don't Overbook Your Night: The Las Vegas Lights Night Tour kicks off at 8pm daily and runs around three and a half hours. That means you won't be done until almost midnight. If you want to do other night things in Las Vegas, stay away from the Vegas lights tours. We can think of about a million and one ways that $50 is better spent in Vegas. Put your wallet away.